An Oceola Township man is hoping a tiny rock will become a big find. Jason Bliss has found what he believes to be a meteorite in the backyard of the home belonging to his fiancee’s parents. “From a geologist’s aspect, this is like better than finding gold, truthfully, because it’s so rare to find on earth,” said Bliss, 22. However, Matthew Linke, planetarium director at U-M’s Natural History Museum, is skeptical of Bliss’ find. For more on this story, check back to the Daily Press & Argus and www.livingstondaily.com. Jason Bliss demonstrates the magnetic attraction between his sample, left, and a small magnet. Bliss believes that this magnetism is more proof of the extraterrestrial origin of his rock-like discovery. A stone cast from the heavens? Jason Bliss has found what he believes to be a meteorite in the backyard of the Deerfield Township home belonging to his fiancee's parents. "From a geologist's aspect, this is, like, better than finding gold, truthfully, because it's so rare to find on Earth," said Bliss, 22. 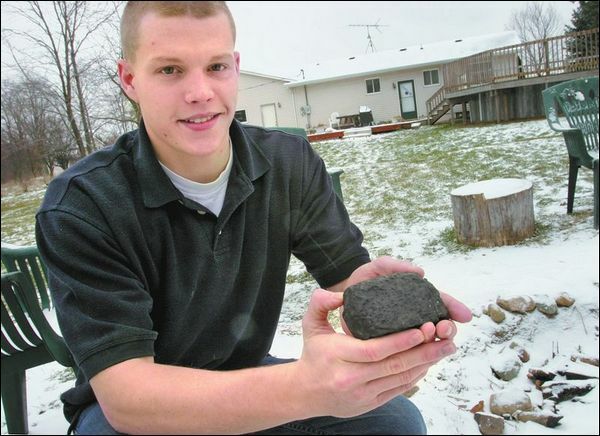 Bliss, who is planning to pursue a degree in geology, said he found the magnetic fist-sized black rock sitting outside a firepit in late August. He said he took it to the Livingston Gem & Mineral Society, which claimed it wasn't a meteorite — but, undeterred, Bliss called professors at both Alma College and the University of Michigan to discuss his find. Bliss, who, based on the rock's darkness, believes it came from the moon or Mars, had a meeting with a U-M professor to show him the rock. "They (U-M professors) said it's most likely not a meteorite and that they had never seen anything like it before," Bliss said Wednesday afternoon. "They're still going to run some more (tests) because they have no idea what it is." Bliss believes the rock fell to Earth 5,200-5,300 years ago. However, Matthew Linke, planetarium director at U-M's Natural History Museum, is skeptical of Bliss' find. "I get a dozen phone calls a year on objects like this, and in my 17 years, only one has been proven to be a meteorite," Linke said. "So, the odds are not very good of it being a meteorite." 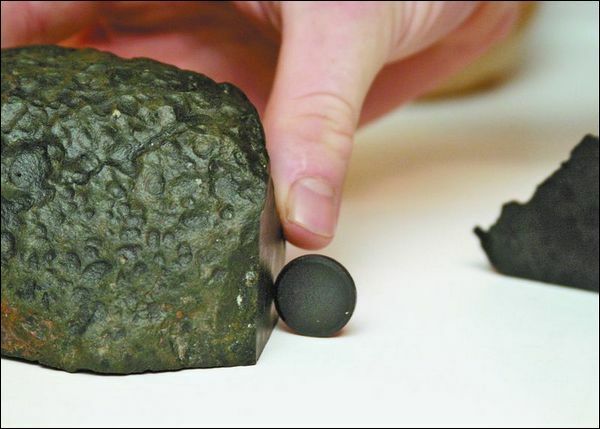 Linke said many objects believed to be meteorites are, in fact, either rocks left behind from glaciers or objects that have been burned or smelted together. There's actually a wing at the planetarium, Linke said, devoted to "meteorwrongs." The fact that the rock was found at a firepit probably means it isn't a meteorite, Linke noted, adding the last meteorite fall in the state was in 1997. Bliss acknowledges the find would be quite rare — he said there's only been 10 confirmed meteorites in the state in the past 200 years, but, based on the pockmarks and streaks in his rock, he has faith that what he found could, in fact, be the real deal. "The professors," Bliss said, "it boggles their minds on what the inside looks like, because they've never seen it before." Contact Daily Press & Argus reporter Kristofer Karol at (517) 552-2835 or at kkarol@gannett.com. found near a backyard fire pit in Deerfield Township. * Anyone can make a claim that they have found or own an authentic meteorite. It is entirely another matter to offer satisfactory proof of verification or classification from a Meteoritical Society approved institution. The information on this page may link to suspect meteorites. In the opinion of this author, these reports may lack either proper verification, credible history or photo, or reasonable supposition to qualify. This does not mean that they are not meteorites, only 'suspect' in the opinion of this author. The purpose of this site is to help the visitor better understand elementary identification of the most common meteorites and to gain insight from the misidentifications of others.